Another SD staple, these mushrooms are also vegan and gluten free and so are great when feeding loads of people with different diets. They are super yummy, hearty, and are one of the all time favourite silent recipes. The base recipe is borrowed from The Garden Of Vegan. You can either serve one big field or portobello mushroom per person as the main event in the meal, or use medium sized cup mushrooms and serve two or three of them as a starter. I find they work best on a bed of leaves, something robust like rocket with a smattering of sunflower seeds, quinoa and a drizzle of oil will do, as the flavour of the mushrooms needs no assistance. Mushrooms – 6 large field/portobello or 18 medium cup. Pre-heat the oven to 180 degrees C. Combine all ingredients except the mushrooms and the vege stock in a bowl. Add the vegetable stock slowly, using as much or as little as you need to get a thick paste consistency. This paste will keep in the fridge for a week or so if kept air tight. Prepare the mushrooms by taking the stems out and placing them on an oven try with a drizzle of oil underneath them. Spoon the mixture into the mushrooms so it is level with the top of the cup. 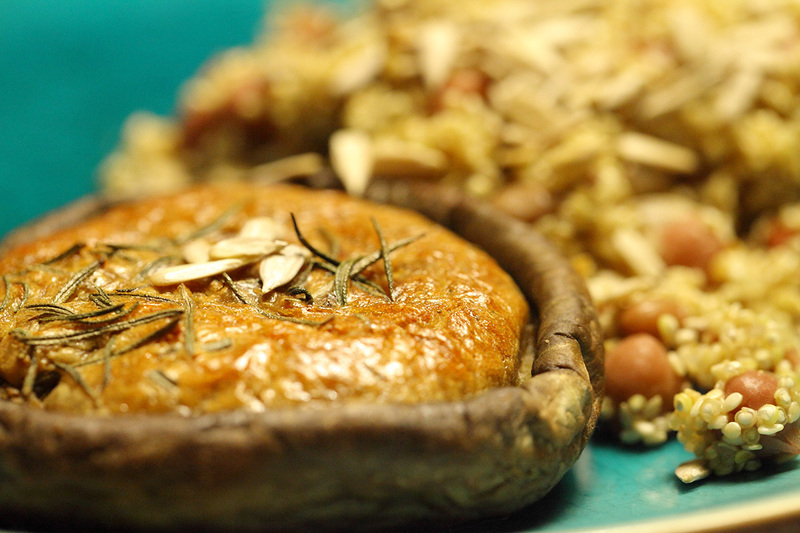 You can sprinkle a rosemary leaf or two on top of the mixture here if you like, then bake in oven until the mushroom is cooked, this will depend on what kind of mushroom you use, but aprox 20 mins for small cup mushrooms, and 30 mins for large field or portobellos. The almond meal mix will rise like a cake and become slightly puffy and browned on the top. Serve on a bed of greens or with a simple side salad and grains.